More than 300 chefs and members of the culinary community gathered in New Orleans for our third annual conference. 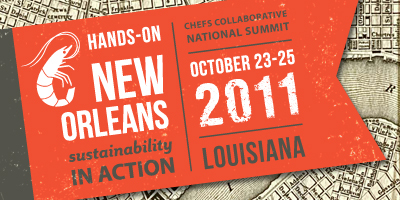 Summit attendees fully embraced the conference theme of “Hands on New Orleans – Sustainability in Action” with four butchery workshops and demos, charcuterie and classic cocktail workshops, and numerous conversations and practical workshops on timely topics including grassfed beef, Gulf seafood, dead zones, farm worker justice and climate change. 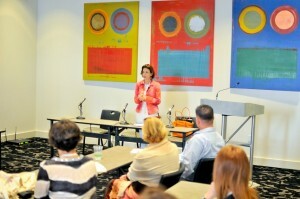 Dana Cowin of Food & Wine. Summit 2011. Credit David Gallent. 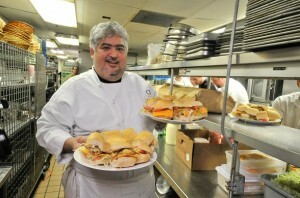 Chef Adolfo Garcia of RioMar, New Orleans, cooking for 2011 awards dinner. Credit David Gallent. 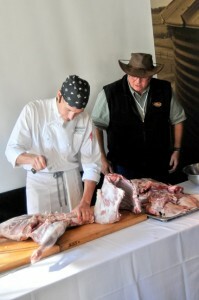 Chef Ryan Prewitt of Herbsaint fabricating a lamb carcass and Shepherd Craig Rogers at Cochon in New Orleans. Photo credit David Gallent. 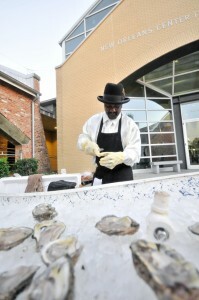 P & J Oysters from the Gulf were a feature of the welcome reception at the New Orleans Center for Creative Arts. Photo credit David Gallent.